The dangers of smoking – including passive smoking – are never far from the headlines. And, in the long term, the health risks are considerable. But smoke can be a much more immediate danger. In the home, especially when you’re sleeping, it can be silent, swift and fatal. You might not wake up when you smell smoke – it can slowly overwhelm you. Then you just breathe it in, reducing your oxygen until you suffocate. You need to know you’re safe in your own home. So you need to take precautions – and you can do that with Quell Fire and Safety products. Quell is part of the Chubb Fire and Safety company, and has 27 branches around Australia dealing with all aspects of fire and safety for government, commercial, emergency services and high-risk hazards. But Quell also has some great consumer products. Products you can use in your own home to help keep your family safe. Like the Quell Fire Safety Kit. Your house can become a much safer place as soon as you buy and install this kit. 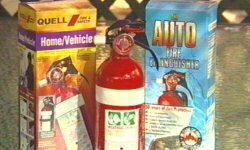 The kit contains a Quell Fire Extinguisher, 2 Quell Smoke Alarms and a Quell Fire Blanket. This Quell Fire Extinguisher is suitable for use on cooking fat fires, flammable liquid fires and electrical equipment fires. Look for Quell in hardware and leading retail stores. And remember – know you’re safe in your own home.